Home > Shop By Brand > Pinnacle Natural Brilliance > Pinnacle Detailer's Bag NEW & IMPROVED! Heavy-duty, curved metal handle that allows taller bottles to fit more easily. This also helps when your Pinnacle Detailer's Bag is full to the brim, but still has to be carried - there's still room for your fingers! The Pinnacle Detailer's Bag is a storage bag and organizer for your detailing supplies, even your polisher! Just like a carpenter's tool box, the Pinnacle Detailer's Bag carries your tools of the trade. 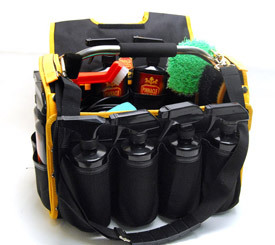 This well-made, generously sized bag holds bottles, buffing pads, brushes, and everything else you need to tackle any detailing job. This bag reminds me of the old-fashioned doctor's bag. It's perfect for a mobile detailer making house calls. With 12 pockets, two large compartments, hook and loop fasteners, and interior elastic straps for small items, the Pinnacle Detailer's Bag literally has a place for everything. At 17 inches long, the Pinnacle Detailer's Bag accommodates the Porter Cable 7424XP and most other polishers. It has a bottom compartment for pads and backing plates. You can fit 10 16 oz. bottles, two 8 oz. bottles in two smaller pockets, multiple detailing brushes and swabs, towels, and there are even hook and loop fasteners on the top of the bag to secure an extra extension cord. Whew! That's a lot of detailing supplies but the Pinnacle Detailer's Bag can handle it. Speaking of the handle, it has a soft grip and there's an optional shoulder strap to keep your hands free. In the pocket underneath, you have tons of room for polishing pads and microfiber towels! Load it up! The rugged construction of the Pinnacle Detailer's Bag means you can fill it full of products without putting any strain on the materials. The stainless steel handle is secured into the hard end panels that give the bag its shape and strength. The entire bag is made of rugged, water resistant, 600 denier nylon canvas. The seams are all reinforced with canvas and metal studs. The bottom of the bag features two non-skid feet. 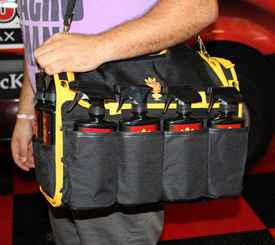 The Pinnacle Detailer's Bag is a must-have for any detailer or hobbyist. The bag is big, its functional, its organized, and it looks great. The black bag has yellow trim with the Pinnacle Natural Brilliance logo embroidered on the top flap. 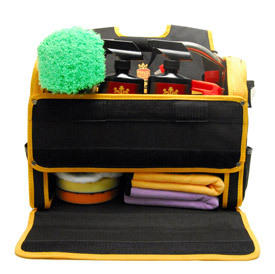 Polishes, towels, a buffer, and pads are the tools of your trade and the Pinnacle Detailer's Bag is your tool box. Pinnacle Detailer's Bag is easily carried by the included strap for increased mobility! Got on a Black Friday deal so couldn't pass up. Nice quality overall but handle is a bit of a hassle to attach. This bag is simply amazing I organized it as a travel bag when I go out of town. Everything I need to detail away from home. This bag holds everything including the kitchen sink (lol). If you don't have it you are missing out. ConsIf you don't have it. FREE FOR SPENDING MONEY WITH AUTOGEEK. That really was not a hardship,, just made it easy to own this bag. Really is High Quality Bag, size is right, holds EVERYTHING, Assembly was not a big deal like some products. see CON. ProsQuality BAG,, Durable nylon / polyester or similar material.. thickness is right to hold some weight. Metal Handle was a nice touch, Pockets on outside for smaller items. Bottom flap to expose where towels can go BELOW FLOOR of the bag held in position by Velcro (six bottles Klasse 32oz size fit and bottom holds with no issues. REALLY is nice to have one bag to grab with ALL the products you'll use. ConsCON, every product normally has a BUT or some ISSUE> Big or small, this one is small and easily corrected. Understand, using customer assembly helps with keeping Bag affordable AND Bag size in Store is small to have MORE bags on hand. FOUR Screws, lock washer and nut are used to hold the Metal Pipe Handle in place. TWO screws per side. Small issue with nylon fabric partially covering hole, would have been NO problem except for the screw issue. SCREWS ARE 1/8" + TOO SHORT, Manufacturer should use NEXT SIZE up for LENGTH that is standard for Diameter and Threads size of this Machine bolt. SPENT HALF HOUR to nearly Hour getting FOUR screws installed. One washer missing, no big deal with Parts Box having spares in bolt/washers drawer. LENGTH being short was pain in the A_ _. Longer screw IS HIGHLY SUGGESTED, ADDED COST IS MINIMAL, AND SURELY SOMEONE ELSE HAS NOTICED? Opinions, everyone has one, the above is mine.